Female performers and presenters ‘stepped up’ with major wins and bold performances. Despite no-shows from some of the music industry’s brightest stars, including Beyoncé, Jay-Z, Taylor Swift and Ariana Grande who called out the show’s producer Ken Ehrlich on Twitter for stifling her creative vision, Sunday’s Grammys still got people talking — all thanks to a surprise visit from Michelle Obama. 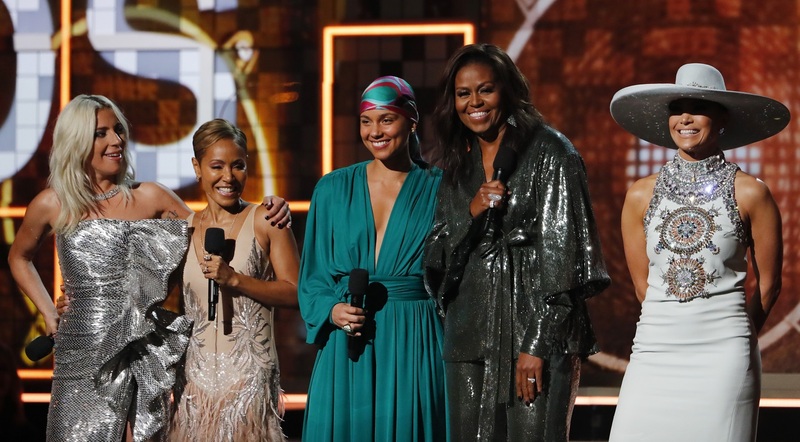 “Music has always helped me tell my story,” said the former first lady, who graced the stage arm in arm with Lady Gaga, Jada Pinkett-Smith and Jennifer Lopez. It was undeniably a banner year for women, with Alicia Keys co-hosting (herself a 15-times Grammy winner), and the dozens of female artists clinching top prizes. Kacey Musgraves won Album of the Year for Golden Hour while Cardi B became the first woman to win Best Rap Album as a solo artist for Invasion of Privacy. British singer Dua Lipa accepted the award for Best New Artist. The Grammys have a track record of under-representing women, especially after last year’s controversy that only one woman won a prominent award during the telecast. Recording Academy (the organisation behind Grammys) president Neil Portnow suggested that women in music should “step up” to advance their careers. This year’s show, however, turned into a celebration of female artists, honouring legends like Dolly Parton and Diana Ross, as well as newcomers like Camila Cabello and H.E.R. Cabello’s performance particularly stood out on a night full of memorable music moments. The singer, who was up for two awards — Best Pop Solo Performance and Best Pop Vocal Album — opened the show from the inside of a brownstone reimagined as a colourful dollhouse. The Cuban-born singer then took it to the streets and "ran into" J Balvin on a bench reading a prop newspaper with the headline “Build Bridges Not Walls”. Needless to say, it was a direct commentary on US president Donald Trump’s ongoing demands for a wall. Lady Gaga, who went glam-punk in an absurd glitter catsuit, delivered a triumphant performance of Shallow (and won Best Pop Duo/Group Performance with it, which she sang in the movie A Star is Born with Bradley Cooper) while Alicia Keys rose to the occasion with a medley of her favourites she wished she wrote, from Fugees’ Killing Me Softly to Coldplay’s Clocks. But it was the Dolly Parton tribute that stole the show. The eight-time Grammy-winning Parton was serenaded by her goddaughter Miley Cyrus, Little Big Town, Katy Perry, Maren Morris and Kacey Musgraves. After a powerful duet between Parton and Cyrus who performed Jolene, the rest of the artists sang the former’s hit 9 to 5, which was written for the 1980 film of the same name that starred Parton, Jane Fonda and Lily Tomlin. We'll be dreaming about this medley for a long time. @DollyParton brought some of the best star power on tonight's stage What have been your favorite performances so far? This year’s Grammy winners were much more equitable in terms of gender (although Childish Gambino’s Song and Record of the Year win for his confrontational anthem about racial injustice This is America is completely deserving), providing some milestone victories for a show that has publicly struggled to address its issues with diversity. The 61st Grammy Awards took place on February 10, 2019, at Staples Center in Los Angeles.